The Comfort Inn Santa Rosa, New Mexico is situated at 2524 Route 66. Santa Rosa which boasts the title of “City of Natural Lakes.” Santa Rosa is centered in Guadalupe County and is the perfect oasis among a natural backdrop of sagebrush, prickly pear cactus, and red mesas. 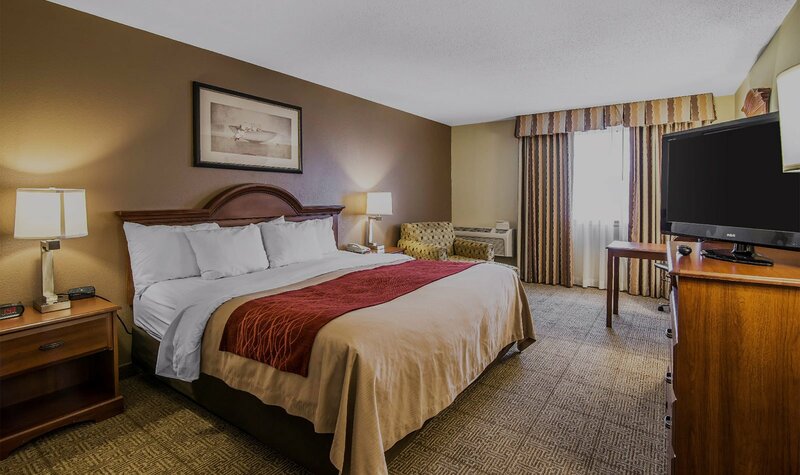 Our location on historic route 66 is less than a hour from the Santa Fe Regional Airport and Albuquerque International Airport. Route 66 Auto Museum is just 1 minute away and for visitors who want outdoor fun, the Santa Rosa Lake State Park is a short drive from our hotel thus making our Santa Rosa Hotel perfect for those interested in fishing, boating, hiking and abundant wildlife watching. Santa Rosa Blue Hole is famous to visitors where guest can take scuba lessons or casually swim in the 80 foot deep crystal clear waters that maintain a temperature of 62 degrees. Park Lake is a local favorite offering an inflatable water obstacle course located 13 minutes from the hotel. 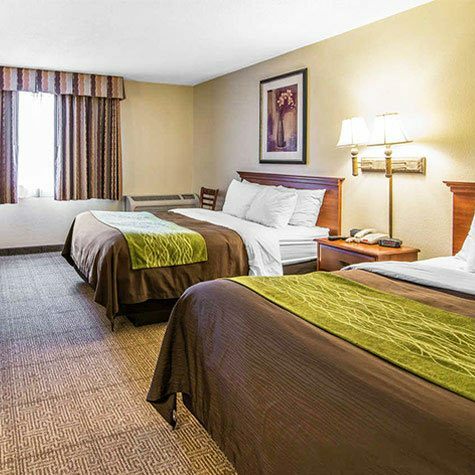 Comfort Inn Santa Rosa, New Mexico delivers a unique guest experience from the moment you arrive to our hotel via our free airport shuttle transport. 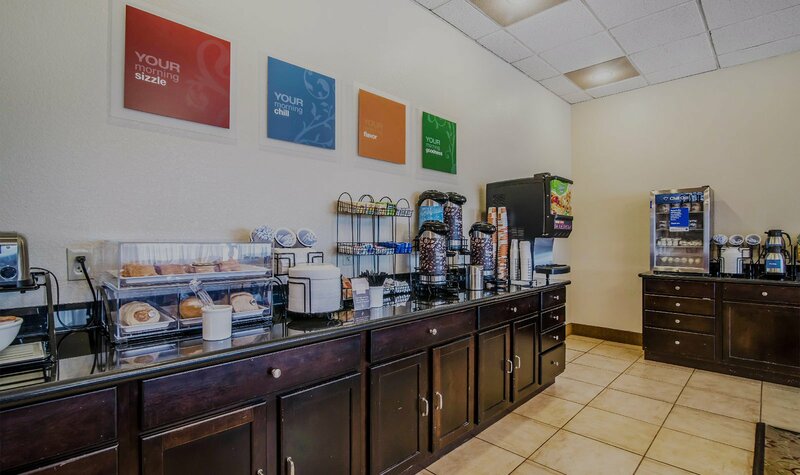 Guests start their day off right with our complimentary continental breakfast. 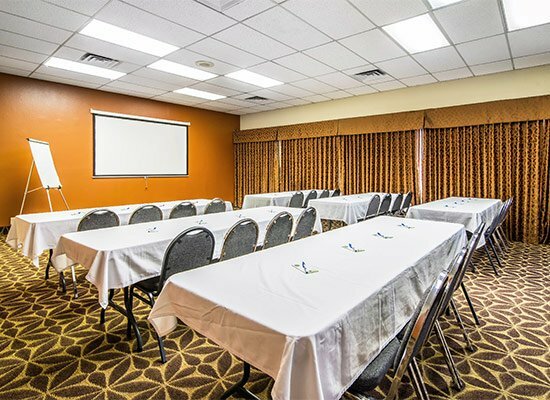 We offer a business center with Fax and copy services, as well as a meeting space that is perfect for hosting your corporate gathering or special event. 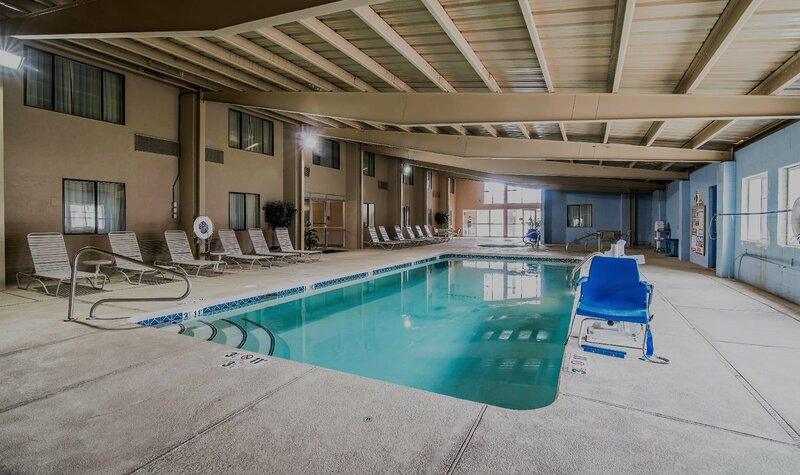 Keeping in touch and streaming is easy with our complimentary high speed wireless internet; in addition, guests can stay on top of their fitness routine in our indoor heated swimming pool or relax after a full day of meetings or exploring Santa Rosa, New Mexico by taking advantage of our indoor hot tub. 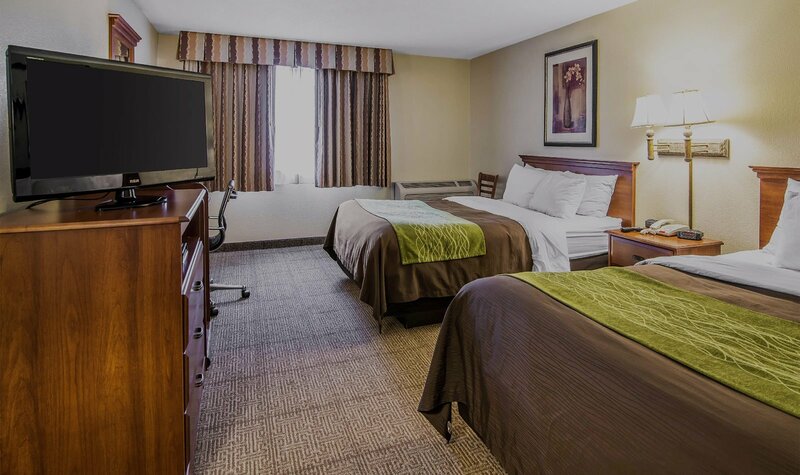 We also offer guest laundry facilities, interior corridors, in-room safes, free accessible parking, and ample outdoor parking for cars, buses, and trucks. Santa Rosa New Mexico is known for its beautiful desert landscape and the network of sinkholes and underground water tunnels that connect the many lakes in the area. Historic Route 66 is the main thoroughfare and is reminiscent of days past offering a variety of quaint neon roadside eateries. The Route 66 Auto Museum is located on the strip and is a Mecca for car enthusiasts; the museum displays an impressive collection of custom and modified vintage cars as well as Route 66 memorabilia. The Blue Hole is linked to a vast natural underground system of water; as a natural artesian spring, the Blue Hole maintains a year-round temperature of 62 degrees and has crystal clear water with seemingly boundless visibility which attracts scuba divers and casual swimmers. The Santa Rosa Lake State Park offers visitors fishing, boating, hiking, and abundant wildlife watching. Park Lake is another local favorite that includes an inflatable water obstacle course that promises a full day of fun. Santa Rosa New Mexico is also home to several markets and boutique clothing shops. The breakfast was amazing. It had everything you could think of. The room itself was pretty big with a couch, desk, flat screen TV, microwave, coffee, small refrigerator, and the best pillows. Our Santa Rosa, New Mexico Hotel is located on the historic U.S. Route 66, one of the first highways in the United States of America. 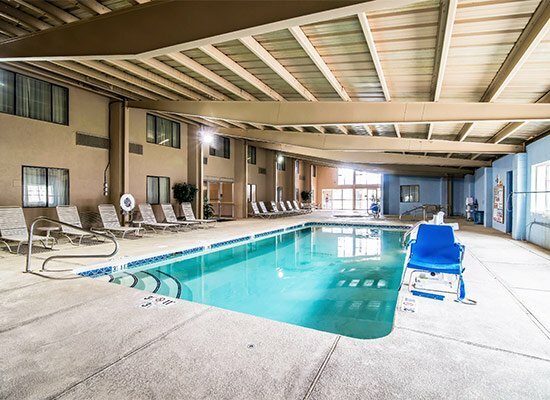 You will find various things to do while staying with us at our Comfort Inn Hotel; from scuba diving at the Blue Hole or touring the Route 66 Auto Museum there is plenty to do for all ages in Santa Rosa, New Mexico. 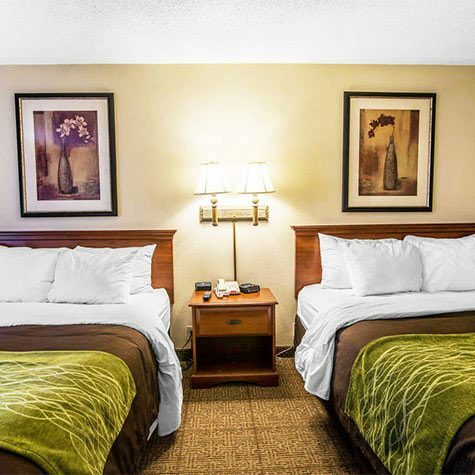 This website is maintained by Comfort Inn Santa Rosa, a licensed user of certain proprietary trademarks and service marks of Choice Hotels International, Inc.